When all you want is to marry the love of your life in an intimate and beautiful location, you do just that! We absolutely love couples who know what they want and aren't afraid to do it. Katie and Andrew knew they wanted to elope and have a meaningful ceremony with just each other. After looking into a few different locations, they decided the Las Vegas desert would be the perfect spot for their nuptials. They fell in love with the desert scenery and loved how it was so different from what they have back home in Michigan. Katie and Andrew were a dream to photograph! Not only are they total hotties, but they're love for each other was so evident and they were so comfortable with each other! Plus, they are super sweet and fun to chat with!! 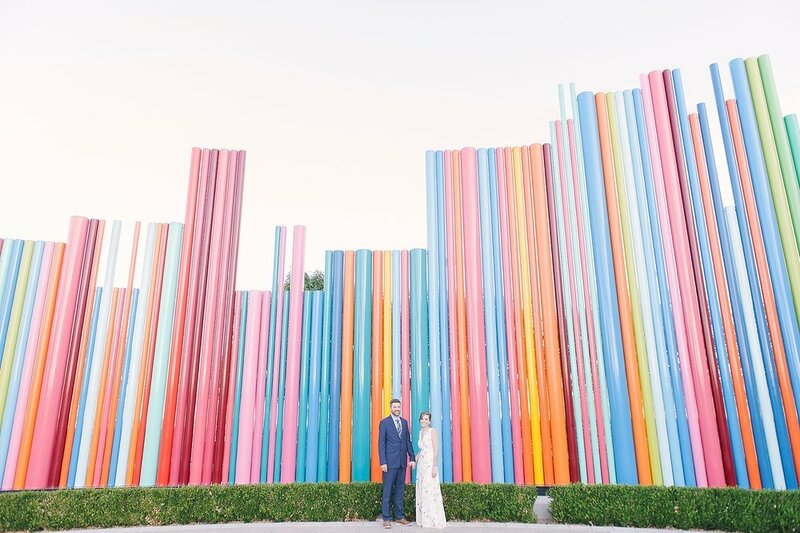 After their gorgeous desert ceremony performed by Peachy Keen Unions and exploring the area there, we then headed downtown for a completely different look! I loved how we were able to capture two different sides of Vegas for them. Photography by The Emerics | Officiant: Peachy Keen Unions | Hair + Makeup: Beauty Studio Inc.